Justin Bieber's latest tattoo has been revealed – in a rather unorthodox place. Bieber's penchant for ink has been long documented, having first gone under the needle when he was 16 years old. The singer has since had more than 50 tattoos, with his latest alluding to his Christian faith. 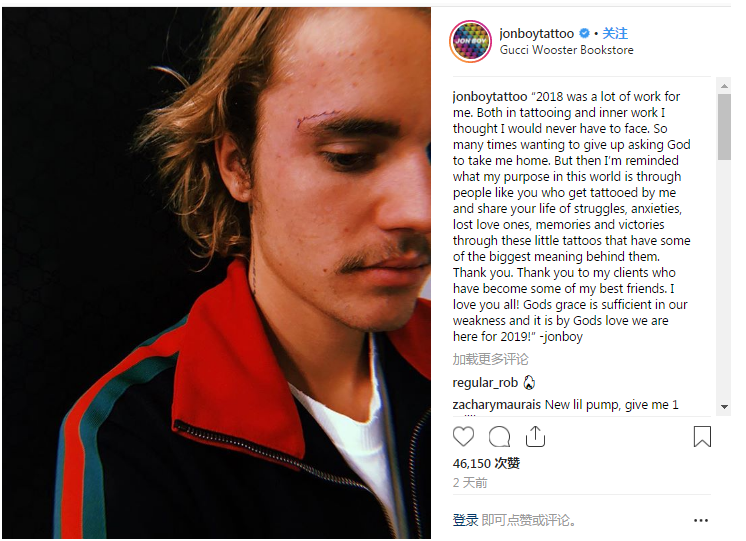 Jonathan Valena , a New York City-based celebrity tattoo artist known professionally as JonBoy, shared a photo on Instagram on 1 January of Bieber with the word "grace" tattooed above his right eyebrow. The tattoo is apparently part of a couple's set, although that of his wife Hailey Baldwin hasn't been revealed. In November 2018, it was reported that Bieber and Baldwin had recently had a couple's tattoo, although no photos of the tattoos were released at the time. Celebrity tattoo artist Kevin McCurdy, who's tattooed the popstar in the past, spoke about the tattoos to Page Six TV. "They each got a tattoo," McCurdy said with regards to Bieber and Baldwin's joint tattoo session. "Justin's tattoo is on his face, and I haven't seen any photos of it – so he's doing a good job of laying low. " McCurdy explained that the couple's tattoo is not "traditional", and described Bieber's ink as "really thin and delicate".